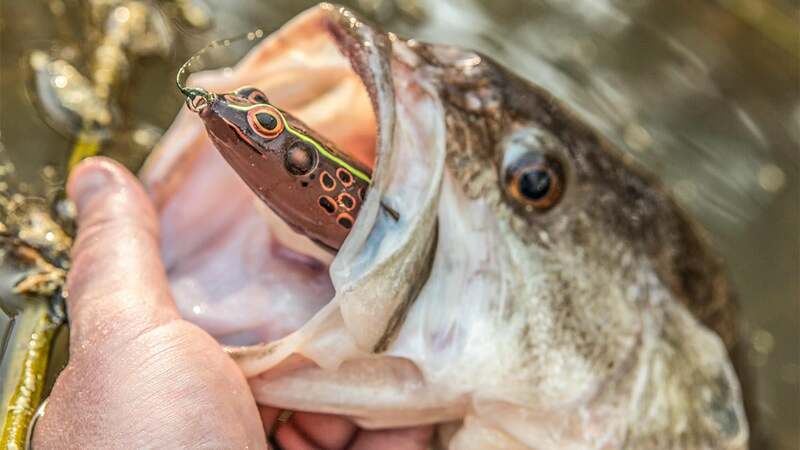 It can be hard to make sense of all the different topwater bass fishing frogs on the market, but I consider the Booyah Pad Crasher a must-have for all shallow-water anglers. I've tried dozens of different hollow body frogs throughout my career but I always have a rod rigged with a Pad Crasher in my boat. I'll explain what makes this affordably priced topwater option so effective. I've spent a long time trying to figure out why the Booyah Pad Crasher gets so many bites. In the last few years, it has outproduced nearly every other frog I've thrown in my area. I'm pretty sure it has to do with its size, however. 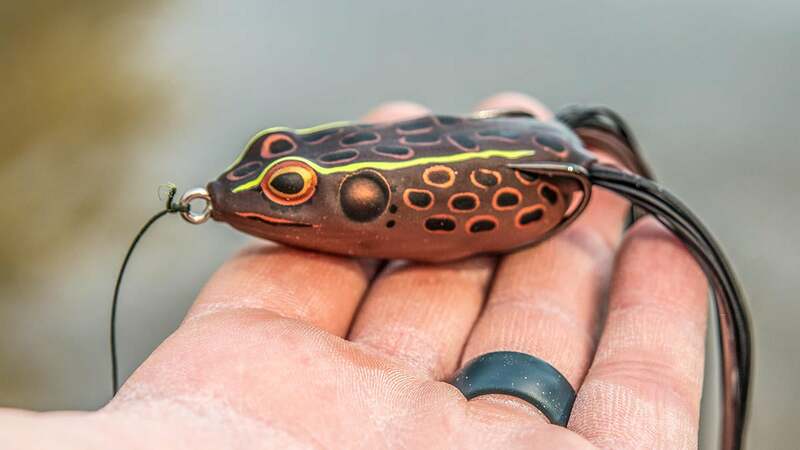 The Pad Crasher is smaller than a lot of other hollow body frogs on the market. As you can see in the photo, it will easily fit in the palm of your hand. Its diminutive stature has proven to be a big-time weapon when the fishing is tough. 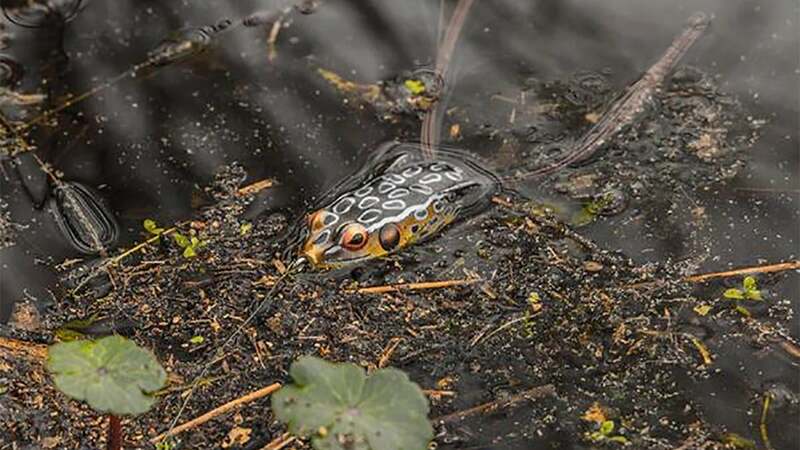 You can fully expect to get bites on this frog from the prespawn all the way through the fall months. I've caught some of my biggest frog bass using the Pad Crasher in post-frontal conditions when most folks normally wouldn't even consider a topwater bait. Although it's a bit smaller than many others, this frog will still cast remarkably well on 65-pound braided line. It also skips underneath overhangs and boat docks easily, allowing you to show those wary shallow-water fish something they don't often see. To be honest, I'm not a huge tinkerer when it comes to fishing tackle. Of course I tinker a little, but I'd certainly prefer to use a bait or lure that's ready to fish right out of the package. The Booyah Pad Crasher fits that bill without a doubt. You'll hear a lot of anglers stress the importance of bending your frog hooks outward and trimming legs, but I haven't had the need to do that with the Pad Crasher. The body is super collapsible and the hooks are incredibly sharp, so I don't need to bend any hooks to increase my hookup ratio. Additionally, it walks much easier than many frogs you'll find, so there's also no need to trim the legs to facilitate a better action. I literally take it out of the package, tie it on one of my frog rods and start fishing. That's about as easy as it can get. Although we just touched on the softness of the body, I think it's worth discussing a bit more. In general, if a frog is too hard, you'll have a tough time driving the hook points into a fish's mouth. If a frog is too soft, you'll spend more time jerking it free from vegetation and cover than you will fishing. The Pad Crasher's body is darn near perfect. 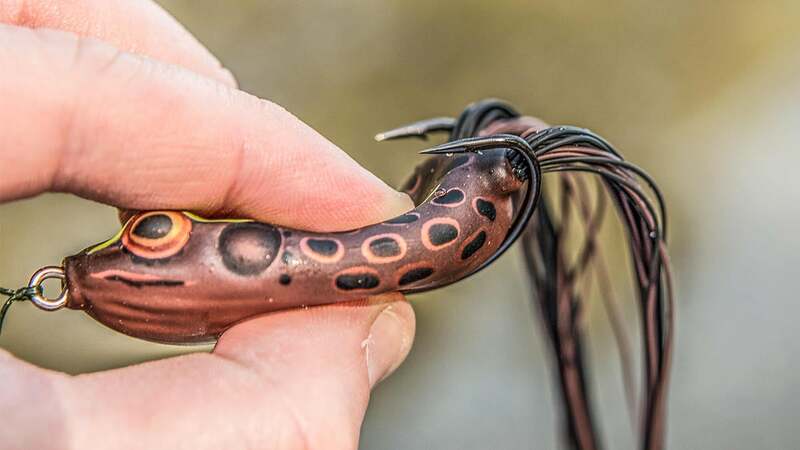 You don't have to wait or count to three before you set the hook with this frog. The large majority of the time, when the bass blows up on it, it's hooked. 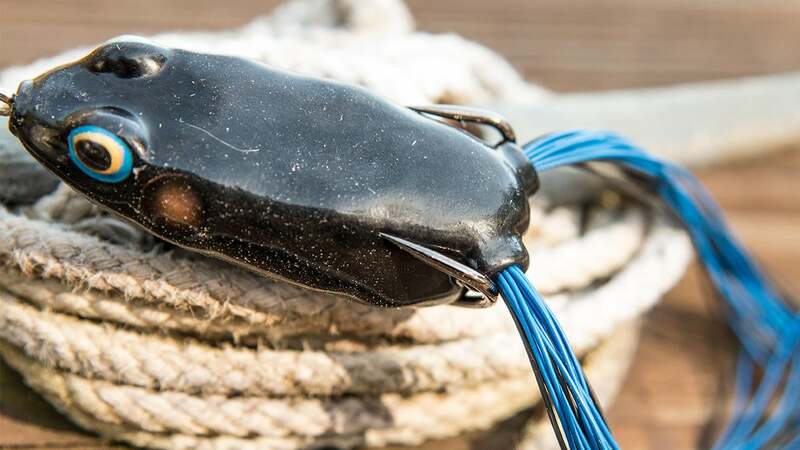 The hook points are tucked in towards the body just enough to avoid obnoxious snags and hangovers too, which really increases your efficiency throughout a day of fishing. Just because the Pad Crasher is soft doesn't mean it's wimpy. I've owned most of mine for several years and aside from a few teeth marks, they've held up wonderfully. It's important to note, however, that I don't have a bunch of toothy critters (pike, musky, etc.) in my area, so I can't really give much insight in that regard. For strictly bass, this is a workhorse of a frog. I've also noticed that the legs don't gunk up and dry rot, either. I've had that problem in the past with other frogs but for whatever reason, it hasn't been an issue with any of my Pad Crashers. You'd be hard pressed to find a better value when it comes to topwater frogs. The Booyah Pad Crasher is affordable (it retails at $6.69) and it flat-out catches 'em throughout much of the year. As long as it's not the winter time, you can look on my front deck or in my rod locker and I guarantee you'll see at least one Pad Crasher rigged and ready to catch a big bass. The Booyah Pad Crasher is available at TackleWarehouse.com.